MINNEAPOLIS — Last season, the Minnesota Timberwolves parlayed the arrival of Jimmy Butler into the franchise’s first appearance in the playoffs in 14 years. Butler’s request for a trade has yet to be fulfilled. After three consecutive lackluster preseason performances by the Timberwolves, Butler joined practice on Wednesday and created quite a stir by verbally challenging teammates and executives during the session. Butler’s stance about wanting to be elsewhere, belying his career-long bond with Thibodeau since their time together with the Chicago Bulls, still makes a deal the most likely outcome to a sideshow that has complicated the challenge the Wolves were already facing to return to the playoffs. The Western Conference competition has only stiffened, with the arrival of LeBron James in Los Angeles. “I want to bring this city something special,” Towns said. TOLLIVER’S TREYS: The Timberwolves finished last in the NBA in both 3-point tries and makes in each of Thibodeau’s first two years, failing to join the league-wide trend of pace-and-space offenses that value the long-range shot more than ever. One of Thibodeau’s moves to change that was a one-year contract for Tolliver, the 11-year veteran power forward who spent two seasons earlier in his career with Minnesota but has since developed an even sharper 3-point shot. Tolliver hit a career-best 43.6 percent of his attempts from behind the arc, the seventh-highest rate in the league. 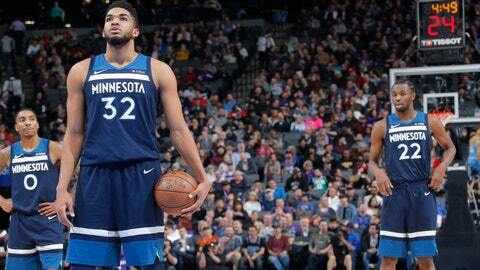 DEVELOPING DEFENSE: One of the purported reasons for Butler’s discontent with the Wolves is the approach to playing defense by Towns and sidekick Andrew Wiggins, whose strengths lie with the ball in their hands. As a team, the Wolves have been in the middle of the pack in the league in two years under Thibodeau, but without Butler they’ve lacked the shutdown defender who can take on an opponent’s best player and produce a stop or a steal at a critical point in a game. SCHEDULE, FOR STARTERS: The home opener is on Oct. 19 against the Cleveland Cavaliers, with former Wolves star Kevin Love now the focal point of a James-less squad. James and the Lakers visit Target Center on Oct. 29, with former Wolves point guard Ricky Rubio and the Utah Jazz due in two days later. Then they travel to Golden State to play the reigning NBA champion Warriors on Nov. 2. The first 10 games will tell the Wolves a lot about where they’re at, Butler or not.